One rarely finds a plant that is valued for both its foliage as well as its flowers. It is rarer still to find one whose leaves add light to the darkest corners of the garden and whose blooms mirror the blue of the sky. 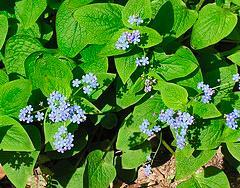 But these are just some of the attributes of my favorite perennial, Brunnera macrophylla. For a plant that is so small in stature, it is surprising that it adds such a punch to a shaded area. Variegated heart-shaped 4 to 6-inch leaves rise from short, fibrous rooted rhizomes to form a tight mound. Showy clusters of ¼-inch blue, forget-me-not-like flowers float on wiry, 1 ½ to 2 ft. stems from early spring to Memorial Day. Brunnera is happiest when planted in full or filtered shade. It may be massed as a low border, planted between shrubs or used as a small-scale ground cover. It is equally at home in a woodland setting. In cooler climates, some species can tolerate sun 4 to 6 hours-a-day. However, the leaves of variegated forms may scorch if they receive too much sunlight. This easy-to-grow perennial performs best when its crown is planted at ground level in fertile, humus-rich, well-drained soil. It requires moderate watering but tolerates dry spells once established. However, plants may go dormant if subjected to a persistent lack of water. Conversely, the plant is not afraid to get its feet wet and may be found growing along the water’s edge. Fertilizing is not recommended when you first plant or during its initial growing season. In addition to all its positive aspects, Brunnera is deer resistant and relatively pest free, except for an occasional visit from a slug or snail. The plant’s mounds increase slowly, so seldom need dividing. If desired, however, you may divide in either spring or fall. You’ll also be rewarded with self-sown seedlings that suddenly appear near the parent clumps. In areas of harmful frosts, apply a protective layer of oak leaves, pine boughs or straw. Brunnera macrophylla as a straight species has been prized for generations, but new cultivars have brought renewed attention to the perennial. The following is a sampling of varieties with the same attributes as their parent plant, but with striking variations in leaf and sometimes flower color. They may be found at local nurseries or through catalogs that specialize in perennials. ‘Jack Frost’ is the most popular cultivar due to its delicately veined, silver and mint-green leaves that lighten up the darkest border. As is common in all the varieties, sprays of bright blue flowers hover on long, slender stems above the foliage of the plant in mid to late spring. ‘Jack’ handles more sun than most of the other variegated types and withstands temperatures just below freezing. ‘Looking Glass,’ a sport of ‘Jack Frost,’ is the only Brunnera cultivar that has truly silver-toned leaves. Tuck this little mirror in a shaded bed and watch it reflect every bit of available light. The plant requires minimal watering and is drought tolerant once established. ‘King’s Ransom,’ another new, variegated sport of ‘Jack Frost,’ is named for a band of gold that borders its green-veined, silvery leaves. Toward the end of spring, the edge widens and its luster fades to cream. This is a beautiful specimen amid a grouping of ‘Palace Purple’ Heucheras. ‘Dawson’s White’ This cultivar’s heart-shaped leaves are exquisitely scalloped with snow-white margins which set off their rich green centers. This vigorous perennial is able to withstand long periods of sun on its foliage. ‘Hadspen Cream’ and ‘Variegata’ are two British introductions whose felt-like, pale green leaves are painted with cream-colored swaths along their margins. These variegated cultivars are slower to spread as ground covers and are prone to wind or sunburn if not planted in a cool, sheltered location. ‘Langtrees’ The heart-shaped, dark green leaves of this cultivar are speckled with silver dots between their veins. This silver sheen again seems to reflect the sunlight. Grow this handsome specimen in a container as a companion to daffodils and other spring bulbs. ‘Emerald Mist’ is considered a delicate step up from ‘Langtrees’ as its leaves are more generously splashed with silver. ‘Betty Bowing’ and ‘White Bear' substantially textured, bristly leaves, which contrast with 12-inch stems of clouds-like, tiny white flowers in mid-spring. Fine Gardening magazine recently named Brunnera macrophylla “the best foliage plant for shade.” With its striking heart-shaped leaves and easy-growing disposition, I’m sure you’ll fall in love with it too!